The Diamondback grip is our version of an angled/vertical grip. It can be used in the front, mid-length, and rear positions of the hand-guard. 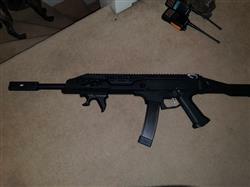 It is ideal for pistol AR’s, short hand rails, and bull-pup rifles. It also has an isolated finger groove and provides a firm grip. It is an excellent choice for close-quarter combat, raids, and clear-outs. Straight onto 20mm picatinny rail. Firm and comfy grip and didn't suffer any hand ache at the end of a days game.